Vivotif (Salmonella enterica serovar Typhi) – the only oral vaccine for typhoid fever – has been given a revised licence acknowledging that it gives three years of protection. The updated Vivotif licence coincides with research which has shown many travellers would prefer an oral vaccine to an injection (48% said they would opt for oral, whilst 43% would choose an injection), and 79% expecting to be given a choice of travel prevention options by their nurse or pharmacist. Until now, Vivotif’s licence covered it for one year of protection for people travelling to endemic areas. Now, following authorisation from the European Commission, the vaccine has had its licence updated so that it can be used to provide three years of cover – the same level of protection as injectable typhoid vaccines. In addition, Vivotif can now be given to children aged five and above. Typhoid fever is a potentially severe and life-threatening infection caused by the bacterium Salmonella enterica serotype Typhi (Salmonella Typhi). Vivotif is an oral vaccine that stimulates an immune response against Salmonella Typhi. It is taken as a three-capsule dosage, with a person taking capsules on day one, three and five. Travel health experts say the licence change is likely to encourage wider usage amongst healthcare professionals offering travel vaccines. Said Carolyn Driver, Independent Immunisation and Travel Health Specialist Nurse: “This increase in duration of protection is a very useful change – it will improve nurses and healthcare specialists’ confidence in Vivotif if they know it provides the same duration of protection as an injectable. 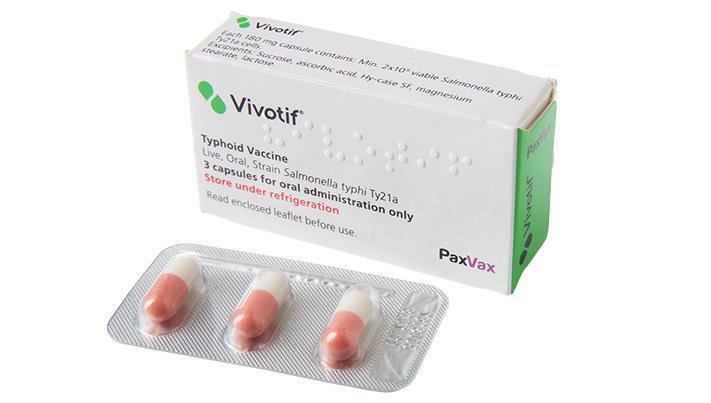 Vivotif is produced, distributed and marketed by speciality vaccine company PaxVax. More than 150 million doses of Vivotif have been marketed worldwide[iv], with postmarketing surveillance showing that adverse reactions to the vaccine are generally infrequent and mild. PaxVax’s UK Country Director Alexandra Charles: “As specialists in the vaccine market, PaxVax is committed to helping protect people against infectious diseases and this change in Vivotif’s licence is positive news for both healthcare professionals and travellers.